Last week, I took a quick hop up to New York with my daughters to visit Banana Republic‘s design studios. The trip came courtesy of my lucky 12 year old, Elana who won both the tour and $400 in spending money in a contest at Miss O and Friends. Though I was happy for my daughter, initially I balked about losing a work day during a period when I’m swamped. Plus, fashion doesn’t come very high on my interest list; I’d have preferred a tour of a court room or even a baseball game. But I needn’t have been so stodgy, because as it turned out, even the fashion industry offers some valuable real life marketing lessons that could benefit lawyers. 1. Advance Planning: During the tour, we visited a room where designers are planning the Fall 2010 season. With this lengthy design cycle, designers need to be adept at spotting trends and predicting what looks will in demand a year from now. By contrast, lawyers rarely take such a long term view. 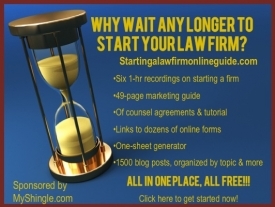 Sure, many law firms write business plans that project number of clients or revenues generated, but there’s little focus on the broader picture, such as what will the legal industry look like a year from now or how will technology transform client expectations or lower the costs of services that we deliver? Used to be that law moved at a snail’s pace, but like fashion, the pace of change is accelerating and like designers, we need to spot emerging trends and then position ourselves to capitalize on them. 2. Know Your Customer/Clients: Many marketing books aimed at lawyers speak to the importance of understanding the characteristics of your “ideal client” so that you can focus your marketing efforts. Once found, however, there’s little discussion of how to keep ideal clients or to adapt your style to their needs. For example, if your ideal client is a person who doesn’t have many assets and wants a bare bones estate plan for peace of mind, pushing a $10,000 plan with all the bells and whistles isn’t a very effective approach (suggesting the plan is one thing, but a hard sell is another). Could you describe your clients in that personal a manner? And if you can, what measures are you implementing in your practice to serve your clients and make them lifelong customers? 3. Outside Inspiration: So how do designers come up with new looks? They seek inspiration from all sources – history, art and just walking around the streets of different countries. That’s a reminder to us lawyers that ideas for marketing our practices don’t just come from other lawyers or law firms, but form different industries as well. 4. The Passion: Few lawyers rarely express passion for their work. Some contend that law school subdues any passion that students have. And if passion isn’t sucked out in law school, then many lose it under the strain of mind-numbing work. Just check out the comments at sites like Above the Law to get a sense of the contempt that many lawyers hold for the practice of law. By contrast, the Banana Republic designers couldn’t contain their passion for their work. Even when the other mom on the tour asked the designers to describe the downside of fashion and the hard work that a career in fashion entails (bless her heart! ), the designers had a hard time complaining. “Well” said one, “Sometimes, we have to work until 11 when we have a deadline,” but then added that the time goes so quickly when you do something you enjoy. Likewise, another griped about the downside of travel like being stuck for 8 hours on a flight, but it was clear that the preceding five days spent in an exotic location outweighed this inconvenience. Perhaps passion isn’t as essential in law as in fashion. After all, the creative process of design is fueled by passion or inspiration, while it’s possible enough to sleepwalk through writing a workman-like brief that gets the job done but doesn’t light any fires. On the other hand, perhaps we lawyers too willingly settle for work without passion when we don’t need to do so. So all in all, my trip to Banana Republic was both fun and productive. Lots of real life lessons to implement in my practice but better still, a terrific day on the town with my girls.